Attorney Marquez discusses the writ of amparo and the writ of habeas data. The Philippine’s human rights record rated dismally in the recently released report of Philip Alston, United Nations special rapporteur. 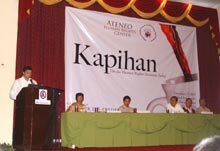 The prevalence of extrajudicial killings, enforced disappearances and arbitrary executions was one of the issues discussed in the Friedrich Naumann Foundation (FNF), Ateneo Human Rights Center and Philippine Working Group for an ASEAN Human Rights Mechanism sponsored human rights forum in Quezon City on 12 December 2007. The conference brought together actors from different sectors to evaluate what has been done for the protection of human rights. Max de Mesa, Philippine Alliance of Human Rights Advocates chairperson, stated that the grim finding of the Alston report is due to the existing coercive environment. It is this culture of impunity that allows the military to abduct, torture and kill activists. He stressed that even though Alston’s report ended with recommendations, Alston himself emphasized that these suggestions will make little difference unless the military has a change of heart. Senior Superintendant Sarmiento outlines the PNP's human rights program. To counterbalance the military’s abuse of power, Attorney John Midas Marquez, chief of staff of Chief Justice Reynato Puno, discussed the Supreme Court’s approval of the rule on the writ of amparo. He explained that the Supreme Court adopted this petition to hold public authorities accountable. It allows individuals a remedy should they feel that their right to life, liberty or security has been violated or is threatened. Since coming into effect last October, the petition has successfully obtained the release of a member of Bayan Muna who was abducted by the military. Eight petitions have currently been filed. Marquez also talked about the Supreme Court’s current deliberation on the issuance of the writ of habeas data. This will further safeguard individuals, as it not only protects their privacy, but it also allows them access to information about disappearances and killings. The Supreme Court will draft it by the year’s end, and it will take effect on February 2008. 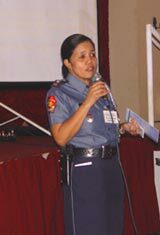 Acknowledging that the police also need human rights education, Philippine National Police (PNP) Senior Superintendent Lina Sarmiento spoke about the PNP’s Human Rights Desk. She also presented its human rights program. She outlined its components as follows: institutional policy development on human rights, capability building, prevention and control of human rights violations and multi-sectoral cooperation.